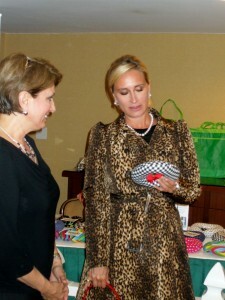 Once again Charlotte Reed, celebrity and pet product expert of Pet Socialite Events hosted a fabulous event on Tuesday, April 5th in New York City. The Better Health and Wellness Pet Product Showcase event not only included some of the coolest new pet products this pet professional has seen in a long time, it was also host to many celebrities in attendance. “I decided to do this showcase on Better Health and Wellness, because as more and more people are concerned with their own health and wellness, they are now looking for healthier, better, more organic and green products for their pets,” stated Charlotte Reed. One of the first new products, I was really wishing had been invented while my other dog was still living since she always seemed to get minor cuts and scraps while playing, running, or on hikes is the PawFlex™ Bandages. I used to have to keep rolls of bandage, tape and gauze in the medicine cabinet – just in case – and this will solve that in an all-in-one simple solution, fantastic! PawFlex is the first disposable, non adhesive stretch duel hook fastener bandage system designed specifically for our pets. 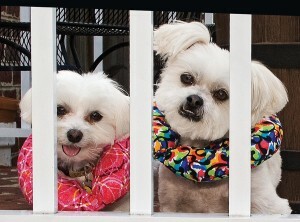 Based in Brooklyn, and created by Jennifer DiGrazia, CEO of PawFlex – because of their beloved blind dog Maddy that she rescued, read more about it here. Each bandage design has been specially created for a specific problem area regarding wound care as well as for distinct characteristics that has made past bandages less than adequate. Also, each individually wrapped PawFlex bandage has a wound pad already attached, making it the first and only “ALL IN ONE” bandage for dogs. 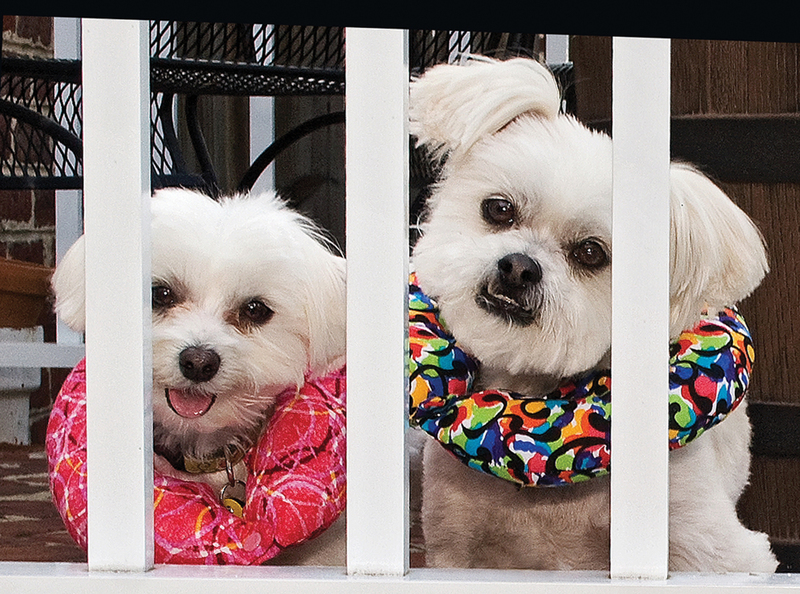 To prevent a little dog or puppy from falling off a balcony, your deck, through a slotted fence or baby gate – this next product is not only for safety, but pretty cute and very functional too. Puppy Bumpers® originally called “Condo Collars” were invented by Ann Price in order to keep her own dog from getting through a baby gate. The patented Puppy Bumpers® have been endorsed by dog trainers, veterinarians and other dog professionals as a non-aversive way to keep dogs safely inside a fence. 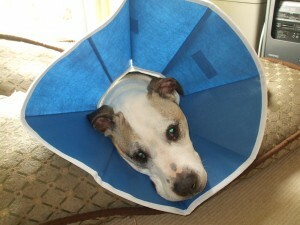 Did your pet just have surgery and is now a wearing a dreaded plastic e-collar and bumping into everything with it? There is a better solution, the Trimline™ Recovery Collar. Made from a specially designed fabric that is water resistant, non-allergenic and non-toxic, the Trimline collar easily slips over a pet’s head stays in place thanks to a drawstring design and is strong enough to withstand chewing and clawing. You also don’t have to worry about your pet bumping into things with the hard plastic e-collar with this new Trimline Collar – my dog would sometimes get stuck in doorways with the old big plastic e-collar on and scratch and dent furniture or walls – this won’t happen with the Trimline Collar. My dog Max modeling the collar! 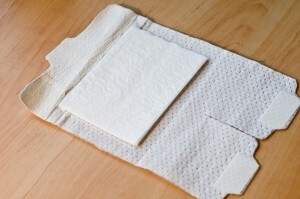 It is also folds, which is great to keep in a first aid kit in your car and one in your home. The collar is an effective, flexible, collar for use with cats and dogs during grooming sessions or experiencing injury, surgery and trauma restraint conditions. It allows the animal to eat, drink and sleep in comfort while providing a barrier to the treatment area for licking and biting. It is soft, lightweight and easily applied with a simple drawstring design. Then there was gym equipment made specifically for pets call FitPAWS which are like human fitness balls. 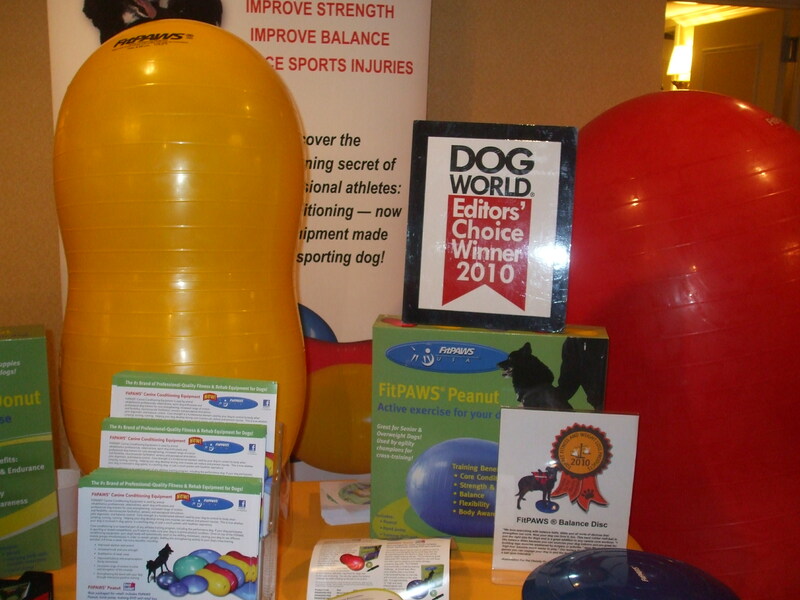 By looking at these you could see why they would be beneficial for pets with arthritis, that need physical therapy, and for pet enrichment and fun! One may think a dog wouldn’t know what to do with the products, but all the dogs that were there hopped right on and seemed to instinctively know what to do, it was quite amazing. One pit bull mix was having a blast it was very cute to see him on the equipment. There was also a pet gym set up, that Charlotte Reed designed with pet health, activity and stimulus in mind and had FitPAWS equipment a doggie treadmill and more. Going green – there were also a few different pet products that are honoring the green, holistic, organic and keeping local movement. From very cool, unique and fantastic designed cat scratch posts, bed by Imperial Cat; to green dog beds by Molly Mutt – a dog bed duvet using your own old laundry for the stuffing of the bed; a brand new line of interactive pet toys and products that are safety tested to children’s toy standards by SafeMadePet™ and a local Long Island company; to lavender scented, made from corn, clumping cat litter by World’s Best Cat Litter; and grain free pet treats and raw pet food made from locally farmed products ingredients by Pawgevity™. There will be a few other pet product reviews on products that were at the event coming up, right here on LIPetPlace.com – look for them soon! 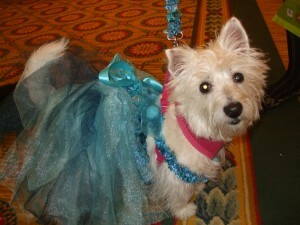 Cubby, celebrity dog from Doggie Moms!